April 8, 2019 – Every brand tells a story. We are delighted to share an interview with strategic philanthropy and impact investing consultant, leadership coach, and NNCG Member Tuti B. Scott, on the evolution of her firm’s brand as she’s expanded her services over the years. What was the initial pain point you were responding to, and what impact did you achieve through Imagine Philanthropy over the past 10 years? I’ve always focused on women in leadership. This has been such a huge part of my life’s work. It’s not only a pain point per se; it’s an incredible missed opportunity. Within the arena of giving, for example, women and girls have been either dismissed or invisible. As a former point guard of the women’s sports and women’s funding movements, and as a coach of coalitions and CEO’s, I have seen first-hand the accelerators and impediments to producing successful teams and leaders. This is lived experience for me, and I love sharing my wisdom and learning with others. For 10 years through Imagine Philanthropy, I catalyzed women’s funds to build courageous, activist, values-led strategic agendas, all with the intention of making change towards equity on a state, national, or global level. More recently, I have worked with coalitions of women’s leadership organizations and lifted this up as a strategy to build a more just and healthy world. What is the evolution of the brand and expansion of the work? The name change from Imagine Philanthropy to Changemaker Strategies reflects the bold work I am doing to move people from thinking of philanthropy as a siloed strategy to one tool of many in what should be a portfolio of options for optimal impact. Most funders think of themselves first as philanthropists trying to make positive change in the world. The next wave of philanthropy, I believe, includes offering practical tools that leverage multiple vehicles by which people and organizations move financial capital for social good. This financial money can move via non profits, equity investments, loans, angel investing, impact bonds, etc. Blending all forms of capital (human, social, financial, political) across sectors is the future for purpose-minded changemakers and change making teams and organizations. writing two new deeply accessible gender lens guides for different audiences, and I am joining What Will it Takes Movements to produce a unique gathering around making money moves that matter. What part of the logo makes sense to carry forward? The heart of philanthropy–the love of human kind–is really a reminder to us all that no matter what, our humanity should be front and center. With regard to giving, spending, investing, and/or saving, we must remember that there are real people struggling, real people growing, real people in need of better policies, practices, and transformative gifts and investments. 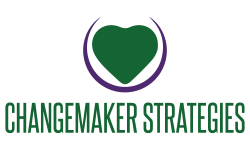 Bringing heart and spirit (the holding of hands in my original Imagine Philanthropy logo) into the Changemakers Strategies logo was intentional. How does the choice to rebrand position Changemaker Strategies for new work? Moving from Imagining Philanthropy to Changemaker Strategies helps us model the necessary shifts we encourage client to make. We all need to upend and reshape the power dynamics that play out in the funding community. In calling myself, my team members, my colleagues, and my clients “changemakers”, I am communicating the fundamental truths that the color and gender of the faces of leadership, the limiting ideas we have of how to use capital, the imbalances of power—all of these things need to change. 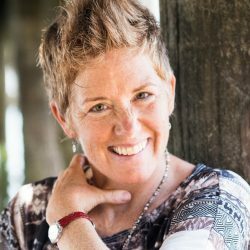 Changemaker Strategies will continue to lead facilitations and retreats and offer coaching, but now we’re doing it with a mandate similar to the B Corp model. We are intentionally focusing on purpose, planet, people, profit, and now more than ever, power.